Balletto Vineyards produces premium quality cool climate, 100% estate grown Russian River wines from their sustainably farmed vineyards in the southern portion of the AVA. Their Russian River Chardonnay is one of the best pairings I have had with fried chicken, or so I thought until I tried the picnic favorite with another picnic perfect wine, their sparkling wines. 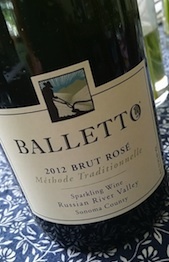 The Balletto Brut Rose, now on the 2012 vintage, is made from 70% Pinot Noir and 30% Chardonnay from their estate. Made in the traditional method, with the second fermentation taking place in the bottle, the fresh, floral and red-fruit filled sparkler is great to start a night, but can also be carried through the entire meal, pairing with options like fried chicken, pasta, light fish or pork dishes, or on to dessert with red fruit and chocolate filled pairings. $42, available via their website. 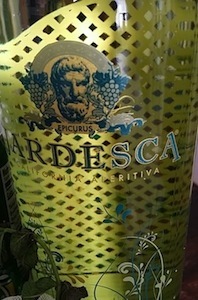 Another, rather new, aperitif option also from Sonoma is Jardesca, a wine based Eau de Vie made from three white wines, both dry and sweet, infused with botanicals, herbs and fruit from California’s bounty, distilled and bottled, capturing the best that California wine and gardens have to provide. Balanced and fresh, with clean floral and fruit flavors to wake up the palate and prepare it for a night of food, fun and friendship, fulfilling the hopes of the three founders, Roger Morrision, Marcus Seiden and Marshall Dawson, whose goal was to enhance the enjoyment of food, life, and living. $30, available via their website. Elegant and refined, focused and sumptuous, with incredible concentration, Wind Racer Russian River Valley Chardonnay, is rich and luscious, opening with golden apple, ripe pear and spice notes, followed by white peach, lemon cream and hazelnut. Aged 15 months in 100% French oak, of which 24% is new, and native fermented, the rich, well rounded wine displays how special Russian River is for growing great Chardonnay. Though we think of Cabernet Sauvignon mostly being grown in Alexander Valley, the region has also been home to tasty Chardonnay, particularly from the higher elevations of the AVA. 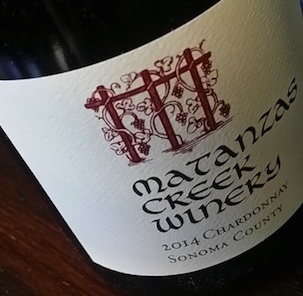 Matanzas Creek Sonoma County Chardonnay draws 75% of their fruit from this part of the region, as well as a touch from Bennett Valley to create a complete wine with layers of baked apple and grilled nectarine flavors, melding with lemon zest, crushed stone and a touch of toasted almond. $26, available at Total Wine & More. Gloria Ferrer is celebrated as a premium sparkling wine house in Sonoma, but they also produce lovely still wines from their Carneros grown, California Certified Sustainable Vineyards Chardonnay and Pinot Noir grapes. Rich and round, yet balancing with a touch of crisp minerality, their Gloria Ferrer Estate Carneros Chardonnay is filled with orchard and stone fruit with a touch of lemon cream and toasted hazelnut. $25, available at Total Wine & More. I like a Sauvignon Blanc with more minerality and floral notes, than just powerful ripe citrus fruit, but also one that can maintain bright acidity and freshness. 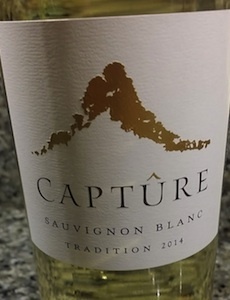 Capture Tradition Sauvignon Blanc, blending both Lake County and Sonoma County fruit from high elevation vineyards of the volcanic Mayacamas Mountains delivers just this. With earthy, crushed stone mineral intensity, melding with layers of tropical fruit, ripe pear and honeysuckle, the aromatic wine is balanced, clean and delicious. $30, available via their website. Ferrari-Carano Fume Blanc from Sonoma County opens with ripe melon and stone fruit notes, with great acidity and texture, thanks to 36% of the wine being aged in neutral French oak barrels on the lees, rounding out the overall profile of the wine. $15, available at Spec’s. From one end of Sonoma to the other, Pinot Noir wines shine, often with with great acidity, lively red fruit flavors and hints of earthiness and floral notes. Consistently, one of the best comes from Pahlmeyer with both their Russian River Pahlmeyer Pinot Noir, as well as their second label, Jayson Sonoma Coast Pinot Noir. I just tried the new 2014 release of the Jayson which highlights another exceptional vintage for the region. Though the overall vintage started off very early, due to a warm winter, the rest of the year progressed on track, maybe even a touch slow, allowing for slow and steady ripening of the vines producing a luscious, fruit filled, yet mineral and earth driven wine with character. This is a great wine for holiday pairings, especially with Thanksgiving meal. $50, available via their website. 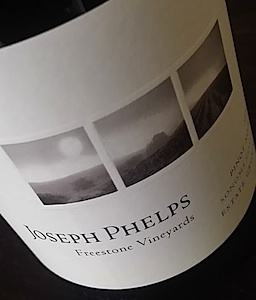 Quite close to Bodega Bay and the Sonoma Coastline, on the fringe of Russian River, Joseph Phelps has Freestone Vineyards, made up of two estate vineyards, Quarter Moon Vineyard and Pastorale Vineyard. Cool, rugged and heavily influenced by fog and the maritime climate of the region, with a very slow growing season. The result, wines of character and quality, like their Freestone Pinot Noir displaying incredible acidity, making it very food friendly. Flavors of ripe red berry, red cherry and spice enhance the wild flower and soft herb filled wine. $55, available via their website. J Vineyards & Winery in Russian River highlights the influence of the river on their wines, with cool breezes coming off the water assisting with the freshness and balance acidity their wines see. Their 2014 J Russian River Pinot Noir leaps from the glass with ripe red berry, cherry and spice notes melding with violets and sweet spice. $40, available at Total Wine & More. Juicy, approachable and soft, Laurel Glen Counterpoint Cabernet Sauvignon from Sonoma Mountain melds spice and dark chocolate notes with black plum, ripe fig and raspberry notes. From organically farmed vineyards with a focus on quality, the wine can easily be enjoyed on its own, as the tannins are quite subtle, or with anything from chicken to steak. $40, available via their website. Consistency, quality and always delicious taste are the three elements that drive Jordan Winery and Vineyards in Alexander Valley, producing stellar Russian River Chardonnay and ripe red and black fruit filled Alexander Valley Cabernet Sauvignon. 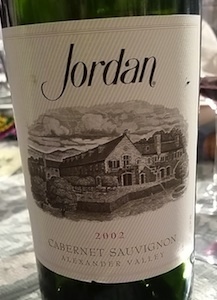 I enjoyed a 2002 Jordan Cabernet Sauvignon not long ago, curious to see how the wine was holding up today, if in fact it was. Happily, it did not disappoint. Still nicely structured, now filled with notes of leather, cassis, dried cherry and dried tobacco, instead of more classic ripe fruit flavors, but still delicious. A solid go to wine for any time of year. $50, available at Spec’s. 125 years ago the Frei Brothers established their Sonoma winery in an area which does incredibly well with fruity, spicy Zinfandel, Dry Creek. Today, Frei Brothers continues to produce approachable wines that help tell the story of the land, particularly with their Dry Creek Valley Zinfandel. A great wine with barbecue, it is filled with blackberry jam, ripe cherry and layers of chocolate, vanilla and spice. $20, widely available. Louis M. Martini is perhaps known best for their Napa Valley Cabernet. However, they also deliver a beautiful blackberry, black cherry and spice filled Cab from Alexander Valley. 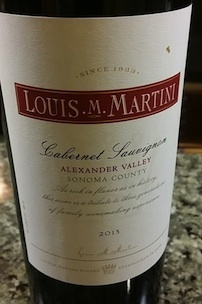 Louis M. Martini Alexander Valley Cabernet Sauvignon has an earthy truffle and woody herb note to the wine, making it great with grilled or smoked meats and game. Slightly rough around the edges, as the tannins do stand out initially, but an hour or two of decanting will allow the wine to open and soften. $35, available at Spec’s.